This #WashDay meme spread like wildfire in the natural hair community, and while utterly hilarious (ranch dressing and a Bible though? ), this fun-poking photo does hold a grain of truth. 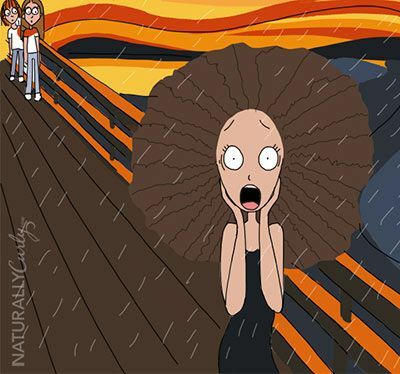 I've come to realize that many naturals and transitioners simply do entirely too much on wash day. As hilarious as this meme is (I get the giggles all over again just looking at each item individually) it'd be nice if wash day wasn't a joke. Here are three key ways to make wash day a little more manageable, and a little less, well, see above. Pre-poo with this. Detangle with a mix of this, this, that, and that, with a little bit of that over there plus water in a spray bottle. Cowash with this product. Condition with another product. Deep condition with a homemade concoction that looks like a menu item from Robek's, or a blend of your favorite conditioner and water. Solution: Stop. Using. Products. That. Don't. Work. If you have to mix 18 things together to make a detangler, then what you're doing isn't working too well. If you constantly have to add oils to your conditioners to make them more moisturizing then well....you might need a new conditioner. Wash day gets easier when you actually use products that work well at what they're supposed to do, or when you discover it has a better alternative use. I cut the fuss between detangling and co-washing because I discovered that Aussie Moist makes a phenomenal in-shower detangler, and I can also use it to co-wash. I only stick to conditioners and deep conditioners that do their job in 10 minutes or less. If it takes any longer, then the formula isn't working for my hair. Sure, an extra 10 or 20 minutes for more softening is fine. But if after 10 minutes I don't feel or see any discernible difference in my hair, it's time for me to move on to greener pastures. As a transitioner and a natural, I can recall needing quite a few things to detangle my hair. Either a complex concoction or conditioner, water, an onslaught of tools, and a Law & Order: SVU marathon. I bought into the blog hype everywhere that detangling had to be some nightmarish event of epic proportions that couldn't be done in under two hours. I detangled slowly with my fingers, in some of the smallest sections imaginable. At some points, I even went practically strand-by-strand. I ended up with pruny fingers, cramped hands, towels full of shed hair and conditioner muck, and a sense of resolve that had been beaten into submission. And I did this every week. Sometimes twice. Solution: Try it once or twice, then move on. Learning which detangling method works for you is a classic case of throwing a bunch of stuff at the wall and seeing what sticks. There are tons of different methods - dry detangling, damp detangling, soaking wet hair detangling, detangling with oil, detangling with conditioner, detangling with a detangler, with your fingers, with a Denman, with a wide tooth comb, with a Tangle Teezer, with a Q-Redew...the possibilities and combinations are seemingly infinite. If your current method has you taking forever and a day, and you're still losing insane amounts of hair due to breakage, or you always have a bajillion knots that don't want to come undone, it's time to lay that method to rest and move on. I'm a huge proponent of slathering the hair with conditioner, and detangling in the shower darting my hair under the shower head a few times for extra slippage. With this method, I'm able to make it through my head in 15 minutes or less. I would have never found this out, if it wasn't for drama point #1 and making a conscious decision to try different methods until I had one that worked. And you better believe that if this one stops working, I'm on to the next! For me, my week of wash-and-go's typically runs something like this (left). Solution: Find the time for your hair (double entendre). The first part of finding the time for your hair relates to literally finding the time for your hair. There is nothing worse than putting off wash day farrrr beyond what you know to be best for your tresses. Extra tangles and matting, even more buildup than you thought possible, and sometimes the dreaded itchies and flakes. It is vital to the health of your hair to find time for it. It is important that the time you set aside for your hair not be rushed, when you're dead tired, or irritated. Any three of those individually or in combination spell disaster, breakage, and utter frustration with your hair. Take it from me: although you don't want wash day to take forever, don't give yourself 30 minutes and a prayer. You'll always end up losing more hair than necessary. 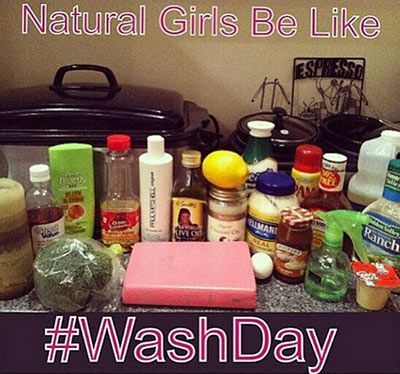 And although wash day should never literally be an entire day in my opinion (like this meme suggests,haha! ), you have to carve out some time to tend to your hair on a regular basis. This brings me to the second part of finding time for your hair -- which is finding the most optimal time table for wash day. 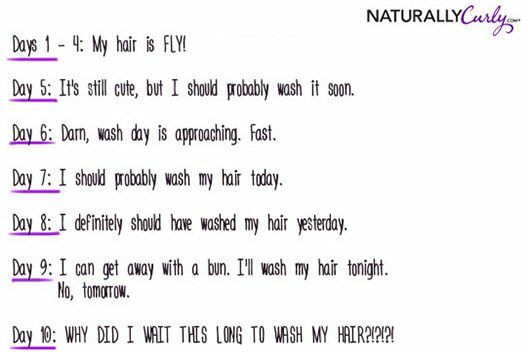 Some transitioners and naturals go two or three weeks, and sometimes a month between washes. For me, I know that one week (seven days) is my cap. If I don't wash and condition by day seven, I'm in for an uphill battle. I learned this by, you guessed it, trial and error. A good starting place is two weeks. If you try washing your hair every two weeks, but realize you don't have as much buildup, dryness, or tangling, then you are one of the lucky ladies that can push it out a week or two more. If two weeks is giving you all sorts of grief, amp it up to weekly. If your tresses still can't handle a week, move it up to twice a week. How else do you avoid the wash day drama? Leave us a comment below, and be sure to visit my blog-ManeObjective.com.